I’m still getting my feet wet with home-made bread making, but am quickly falling in love. After experimenting with a couple ways of preparation, I think I’ve gotten down the method I like the most. Due to my affinity to a lot of Jamie Oliver’s cooking methods/recipes, it may be no surprise that it’s from him that I pull the following recipe (with a few minor changes for my preference). This is a basic/plain recipe that can (and should!) be used as a starting point — it takes a couple hours all said, but actual time in the kitchen “making” the bread is only 20 minutes or so. 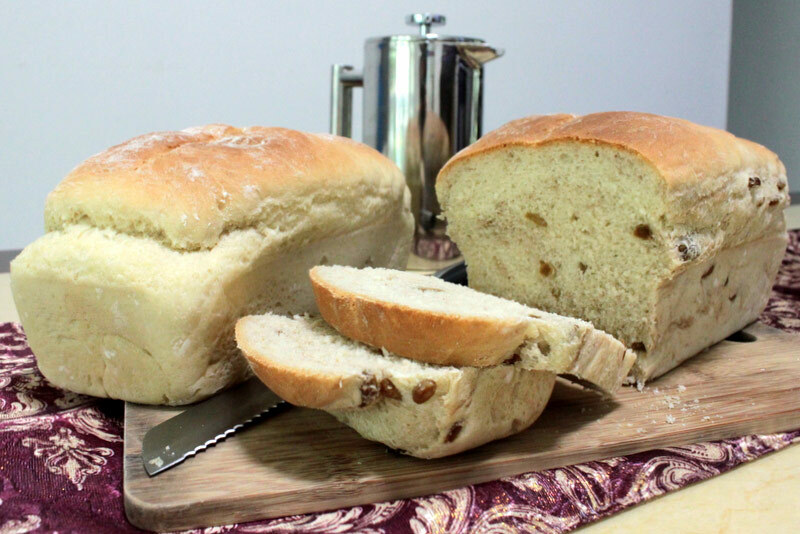 It makes a decent plain white bread loaf by itself, but can be taken in an infinite number of directions. As you can see from my picture, the loaf on the left is a plain white bread, while the one on the right is a cinnamon and raisin loaf — both made from the same base whack of dough. Dump your flour in a bit of a mountain on a large clean work surface. Using your hand or a fork, create a well in the centre of your mountain so it sort of looks like a wide volcano. Pour half your water into the well you’ve made. Mix in sugar, salt and yeast, stirring with fork until dissolved. Begin slowly incorporating the surrounding flour into the water, careful not to break the “wall”, causing your water mixture to spill out. Once the centre becomes a “stodgy” sticky mess, slowly add the rest of the water, and continue mixing in the surrounding flour until it is all incorporated. Kneeding: Now begin to kneed the dough (see this video for how to kneed dough). Kneed the dough for 5 to 10 minutes, until the dough is smooth and elastic. First Proof: “Proofing” dough is letting it rest and letting the yeast do its work putting air in the dough. To proof your dough, simply place it in a lightly greased bowl. Turn the dough around in the bowl to make sure all sides of the dough have been very lightly greased. This helps stop the dough from sticking after it rises from the proofing. Do not use too much oil/butter though — apply with paper towel to help absorb any extra. Cover the bowl with plastic wrap, or a moist cloth/tea towel, and place in a warm (not hot) area for 30-60 minutes until it has roughly doubled in size. After it has risen, turn out the dough on a lightly floured surface and punch the air out of it by kneeding it for 30 seconds or so. You can leave the dough as it is, or split it into more manageable “loaves”. This recipe makes enough dough to make two decent sized loaves (as seen in the picture above). You can also incorporate your flavourings now by kneeding them into the dough. Second Proof: Once you’ve knocked the air out of the dough, portioned it and added any flavourings; it’s time for the final proofing. If you’re baking your bread in a loaf pan, lightly grease the pan and place the dough in it. If you are doing a free-formed round loaf, put the shaped loaf on a lightly greased or floured baking sheet. Cover the dough (same as before) and leave for another 30-60 minutes. Once it has risen again, place in the oven (pre-heated to 180°C) for 25-30 minutes and golden brown. Optionally, if you are creating a free-formed loaf, now is when you’ll want to score it (more info on scoring). After the bread looks baked, you can test for “doneness” by tapping the bottom of the loaf — if it sounds hollow it is done, if not, bake it a bit longer. Place the bread to cool on a rack for 30 minutes before eating. And that’s it. Super easy and delicious — plus your house smells fantastically of warm baked bread for a couple hours. If you missed it, also check out my post on how to make bagels at home. See all Home Cooked posts. Tagged: baking, bread, bread making, cookery, food. Lookin’ good. Keep the recipes coming!